• Respect fire and teach your children to respect it too. bedrooms and on EVERY LEVEL OF THE HOME. • Test and maintain your alarms as if your life depends on it. IT DOES! consider a residential sprinkler system. One home structure fire was reported every 85 seconds in 2010. Most fatal fires kill one or two people. In 2010, 19 home fires killed five or more people. These 19 fires resulted in 101 deaths. In 2010, U.S. fire departments responded to 369,500 home structure fires. These fires caused 13,350 civilian injuries, 2,640 civilian deaths, and $6.9 billion in direct damage. Almost three-quarters of Americans do have an escape plan; however, less than half actually practiced it. Almost two-thirds (62%) of reported home fire deaths resulted from fires in homes with no smoke alarms or no working smoke alarms. In fires considered large enough to activate the smoke alarm, hardwired alarms operated 92% of the time, while battery powered alarms operated only 77% of the time. Cooking has been the leading cause of reported home fires and home fire injuries since 1990. Unattended cooking was by far the leading cause of these fires; Two-thirds of home cooking fires began with ignition of cooking materials, including food, cooking oil, fat, or grease . 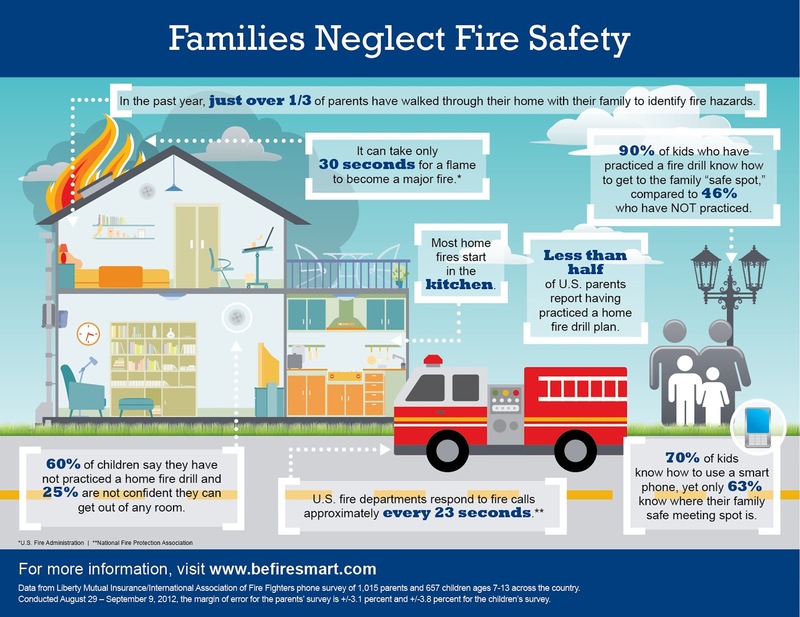 Cooking caused two of every five (42%) of reported home fires, roughly one of every seven (15% ) home fire deaths, and two of every five (37% ) home fire injuries, and 11% of direct property damage from home fires in 2010. Ranges accounted for the 58% of home cooking fire incidents. Ovens accounted for 16%. Children under five face a higher risk of non-fire burns associated with cooking than being burned in a cooking fire. 90% of burns associated with cooking equipment resulted from contact with hot equipment or some other non-fire source. Heating equipment was the leading cause of reported home fires in the 1980s and has generally ranked second since them. It is the second leading cause of home fire deaths. Fires involving heating equipment peak in December, January and February, as do deaths from these fires. The leading factor contributing to heating equipment fires was failure to clean, principally creosote from solid fueled heating equipment, primarily chimneys. Portable or fixed space heaters, including wood stoves, were involved in one-third (32%) of home heating fires and four out of five (79%) home heating deaths. Half of home heating fire deaths resulted from fires caused by heating equipment too close to things that can burn, such as upholstered furniture, clothing, mattresses or bedding. In 2010, smoking materials started and estimated 17,500 home structure fires, resulting in 540 deaths, 1,320 injuries and $535 million in direct property damage. Smoking materials are the leading cause of home fire deaths. Sleep was a factor in two of every five home smoking material fire deaths. Possible alcohol impairment was reported in one quarter of these deaths. In recent years, Canada and the United States have required that all cigarettes sold must be “fire safe,” that is have reduced ignition strength and less likely to start fires. Half (49%) of home electrical fires involved electrical distribution or lighting equipment. Other leading types of equipment were washer or dryer, fan, portable or stationary space heater, air conditioning equipment, water heater and range. In 2010, electrical failures or malfunctions were factors in an estimated 46,500 home structure fires resulting in 420 deaths, 1,520 injuries and $1.5 billion in property damage. On average, there are 35 home candle fires reported per day. More than one-third of these fires started in the bedroom. More than half of all candle fires start when things that can burn are too close to the candle. In 2010, candles caused 3% of home fires, 4% of home fire deaths, 6% of home fire injuries and 5% of direct property damage from home fires. Automatic fire sprinkler systems cut the risk of dying in a home fire by about 83%. Home fire sprinklers can contain and may even extinguish a fire in less time than it would take the fire department to arrive on the scene. Sprinklers are highly effective because they react so quickly in a fire. They reduce the risk of death or injury from a fire because they dramatically reduce the heat, flames and smoke produced, allowing people time to evacuate the home. It is important to have a home fire escape plan that prepares your family to think fast and get out quickly when the smoke alarm sounds. What if your first escape route is blocked by smoke or flames? That's why having two ways out is such a key part of your plan. This year’s theme,“Have 2 Ways Out!”, focuses on the importance of fire escape planning and practice. Educating our kids need to be a top priority. The NFPA website offers important information and fun activities for kids of all ages! Check out a new cool-to-do activity each month!